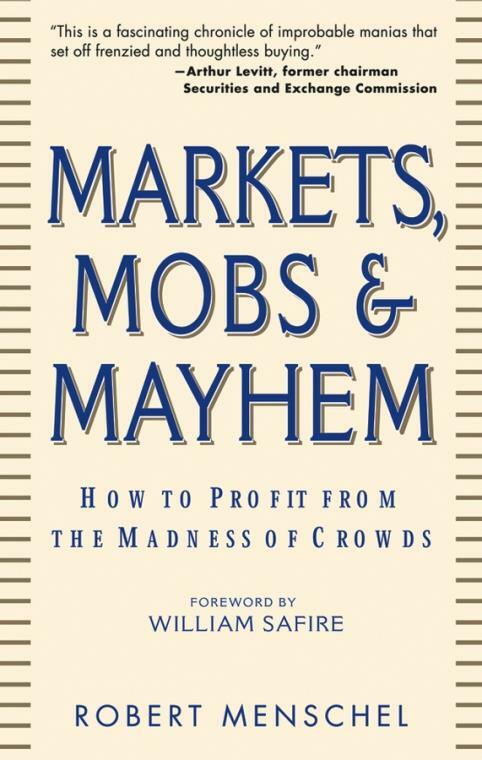 "It′s easy to understand investing excesses by reading Bob Menschel′s captivating, well–written history of the ways investors have been victimized by greed, folly, and chicanery." "Menschel′s timeless anthology on the madness of crowds is full of worldly wisdom, anecdotes, and quotations, with the light touch of our finest cartoonists. It is a useful reminder of what we all knew, deep down, but were afraid to admit: When the perception of stock prices loses its linkage to the reality of corporate values, a day of reckoning always follows." "This book′s lighthearted, level–headed insights may be directed at the business world, but they ring equally true for government and public officials. Robert Menschel gives a valuable perspective on the power of the crowd." "This wonderfully witty and wise book by one of the most successful investors I′ve ever known is a must–read. He reminds us that trees do not grow in the sky and that if it looks too good to be true, it is." John C. Whitehead, former chairman, Goldman Sachs & Co. and Chairman, Lower Manhattan Development Corp.
"This highly entertaining book is for everyone, regardless of age, wealth, or political persuasion. Menschel′s delectable stories expose the roots of human behavior in a variety of fascinating situations, familiar and unfamiliar. Don′t skim; read every word."